Xiaomi Mi3 is probably the most hyped and trending phone in India. Most people are crazy for this amazing phone and wanna buy it badly. But the flash sale strategy of Flipkart is actually make many people angry, as they could not even make a click and the whole stock disappeared. 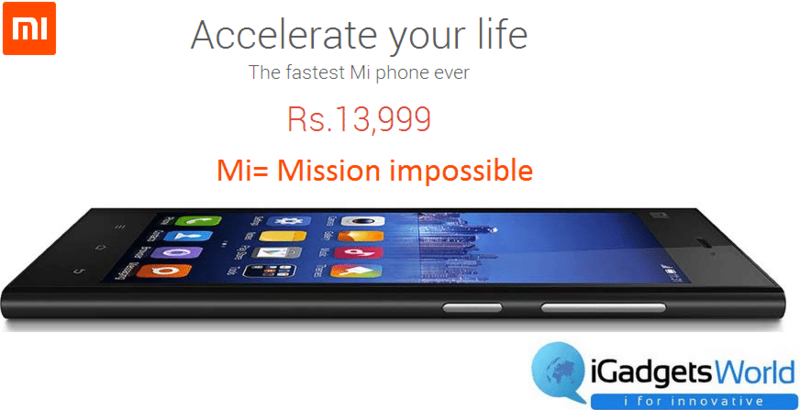 Earlier, we had posted about how you can buy Mi3 without any such hassle in an alternate way. And now, we’re coming up with a new trick, which is the invention of another techie and web developer Akshat Mittal. As we all know that Flipkart went down on the first 2 or 3 days o sale. Though they have made improvements, due to huge traffic, and demand there is quite less chance o successfully adding one Mi3 in your cart. In the last sale, the stock disappeared in just a few seconds. So, why so much craze is building up? The reason is, configuration and features that Xiaomi has provided in Mi3. Let’s take a look at the again. Wel, those are impressive enough to make a huge buzz. So, let’s move on to the main topic. It’s kind of hack that is done with the hep o a script. You just need to be at a computer 5-10 minutes before the sale starts. The detailed method is describe below. Open the Flipkart Mi3 Page. Open the console on this page, hit Ctrl + Shift + J on Chrome. Open this page and copy the code and paste it in the console. This will try to add Mi3 in your cart. Start it few minutes before the sale and keep it running until the sale is over. As soon as it becomes successful to add Mi3 into your cart, it will alert you. Now, just open your cart and pay. You’re ready to rock very soon.